All transactions are safe and secure with a reliable history in online purchasing behind each of our associates. 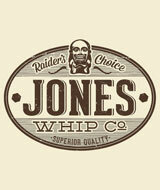 Buy the Jones Whip Co. t-shirt to own Indiana Jones clothing and merchandise. The front of this cool Indiana Jones tee displays a logo for the Jones Whip Co., makers of superior quality raiders choice whips. For Indy (Harrison Ford), going into the whip making business was a natural fit. Whether he's using his whip to disarm an enemy in Raiders of the Lost Ark or unleashing it to help swing over a gap, Indy fans can celebrate his unique skill with one of these Indiana Jones t-shirts. Wear it during your search for rare Indiana Jones action figures and toys. In addition to the Jones Whip Co. tee above, browse the Indiana Jones Clothing Gallery for more apparel like men's and women's clothes, kids shirts or hoodies.